Senate Bill 1000 will strengthen how General Plans address environmental justice to ensure that disadvantaged populations are not unduly impacted by environmental toxins and to provide equitable access to the public decision-making process. The bill was authored by Senator Connie M. Leyva (D-Chino) and co-sponsored by the Center for Community Action and Environmental Justice (CCAEJ) and the California Environmental Justice Alliance (CEJA). The California Office of Planning and Research already requires that environmental justice be addressed in the General Plan. 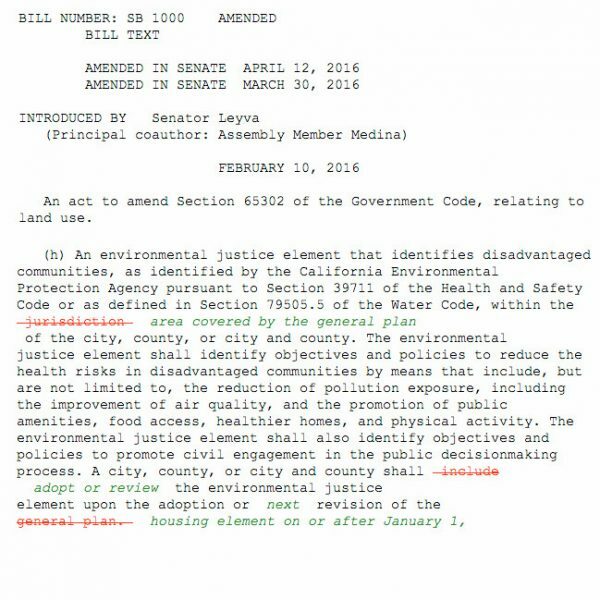 However, SB 1000 will increase the requirements for addressing environmental justice either through the preparation of a standalone Environmental Justice Element or through the adoption of goals, policies and objectives incorporated into other elements. To date, two cities in California have adopted Environmental Justice Elements: Jurupa Valley and National City. SB 1000 was signed into law by Governor Brown on September 24, 2016, and takes effect on January 1, 2017.